"Laboratory Information Management System (LIMS) for Cloud"
This white paper on “LIMS Implementation” is for those bio-banks, clinical research and food & beverage testing labs which are incognizant of the benefits of cloud computing for managing laboratory operations. Why is cloud becoming the best choice for every lab, planning a LIMS implementation? 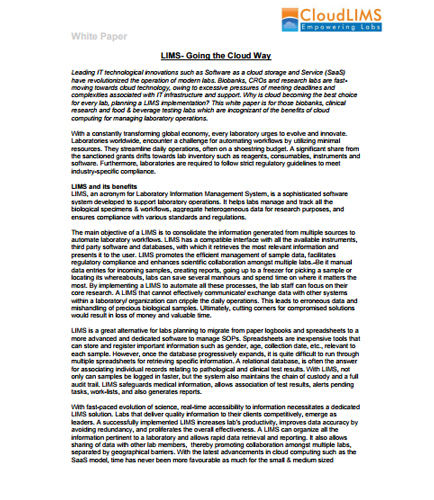 How to scale and rapidly configure LIMS using cloud based SaaS? How can you successfully implement Laboratory information Management System (LIMS)? What is the best effective method of mitigating risks in a well-designed LIMS system? What are the most common LIMS implementation mistakes and how to avoid them?